Colton’s Railroad & Township Map of Arkansas. 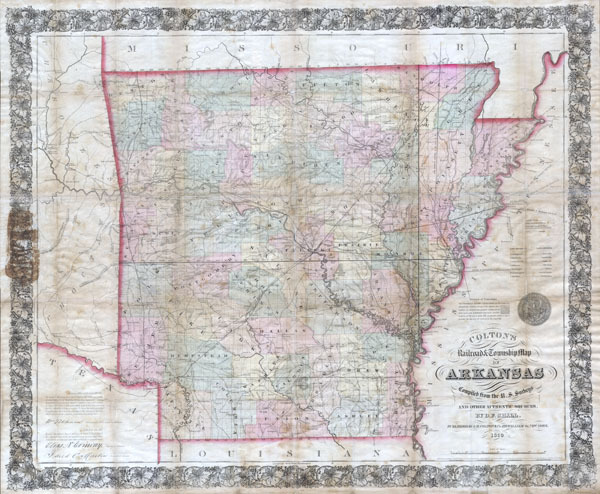 This large and visually stunning 1858 pocket map by J. H. Colton depicts the state of Arkansas. The state of Arkansas is revealed in considerable detail with special attention to roads, railroads, rivers, lakes and towns. The state is cleanly divided into various counties. To the east Texas asppears, as do the Indian territories of the Choctaws and the Cherokees. The state seal of Arkansas is depicted in the lower right quadrant just above the title. Fine decorative border. Dated and copyrighted: 'Entered according to the Act of Congress in the Year of 1854 by J. H. Colton & Co. in the Clerk's Office of the District Court of the United States for the Southern District of New York.' Published from Colton's 172 William Str. Office in New York City. Exceedingly rare. Very good condition. This map has been professionally flattened, baked with Japanese paper, and restored. Glue stain on left margins where the map was originally attached to its binder. Vivid hand color. Blank on verso.